Postpartum depression is defined as the depression that may occur for a new mother following the birth of her child. It arises due to a combination of hormonal changes, fatigue, and the psychological adjustments experienced at the onset of motherhood. However, due to the normal stresses of becoming a parent, it can be difficult to pinpoint the feelings of postpartum depression. 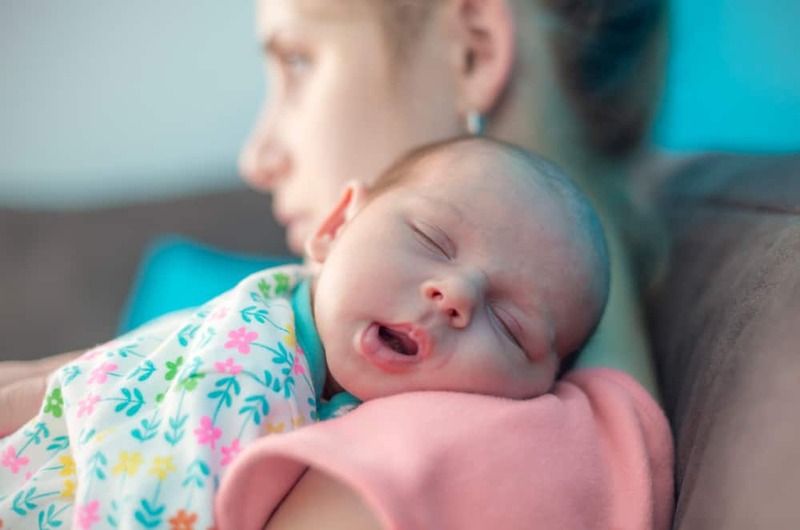 The lack of sleep and the worry about your baby are normal feelings post-birth, which means the symptoms of postpartum depression can easily be missed. Postpartum Depression Or Baby Blues? The “baby blues” are not the same as postpartum depression. Yet, they can feel a bit similar. They are both triggered by the changes which occur immediately following the process of giving birth, when your hormone levels drop and your body is sore and achy. Your breasts may be engorged from your milk coming in, and you are most likely exhausted. The simple task of caring for yourself and your home can be overwhelming. Combine these with caring for a new baby and you may be highly anxious. However, if you have postpartum depression as opposed to the baby blues, your symptoms will be more intense and longer lasting (more than two weeks post delivery). You may have difficulty bonding with your baby, and in extreme cases of postpartum depression, you may even have thoughts about harming yourself or your baby. Postpartum depression is similar to major depression. Most symptoms are the same, but PPD happens after the birth of a child. Major depression can happen at any time in life. Depression is not the only mood disorder that can be triggered by childbirth. There are actually several conditions new moms around the world may face. Postpartum Anxiety: Intense anxiety and panic attacks after giving birth, this condition affects up to 10 percent of new mothers (source). It’s worth noting you can have anxiety without depression. Postpartum OCD (Obsessive Compulsive Disorder):Characterized by an obsessive worry and a constant need to check on your baby. It can include getting up every few minutes to make sure your baby is still breathing throughout the day and night. Studies have shown that up to 57 percent of women with postpartum depression also have postpartum OCD (source). Postpartum Psychosis: This is a rare condition that is experienced at a rate of only 0.2 percent of births (source). Although rare, it is severe and can include delusions, hallucinations, and an inability to communicate. Postpartum PTSD: Approximately 9% of women experience this after giving birth (source). If you are feeling despondent, anxious, or that you can’t get out of bed and care for your baby, you should speak with your doctor. Only about 15 percent of moms who suffer symptoms actually seek help for postpartum depression (source). Not seeking treatment can come with consequences for you and your baby. Your depression can hinder your ability to care for your infant, causing you to withdraw, and possibly even respond to your baby in a negative way (source). You may find that postpartum depression is leading to breastfeeding difficulties, discouraging you to continue (source). Having difficulty bonding and breastfeeding may also further exacerbate the postpartum depression — you can feel like a failure, leading to more sadness. It can be a vicious cycle. We know it’s easy to feel ashamed or doubt your abilities. But don’t ignore your symptoms, and let your doctor or mental health professional know right away if you’re having such feelings. Even if it turns out to be the baby blues, it won’t hurt to have a healthcare provider monitoring the situation. In reality, every new mom has a chance of developing postpartum depression. However, there are certain factors that put some at a higher risk than others. Even if a factor or two apply to you, it does not mean you’re destined to suffer from this condition. If you’re a new mother, the symptoms of postpartum depression can leave you feeling confused and scared. However, it’s good to remind yourself that you aren’t alone, and you don’t have to continue feeling the way you do. The treatment that healthcare professionals can provide will not only make you feel better, but will also help you take better care of your newborn. It can even increase your ability to create a stronger bond with your child. Early screening for postpartum depression could lead to receiving helpful information in a timely fashion (source). Becoming aware of the services early on can lead to a better prepared mommy. The more risk factors you have, the earlier you should speak with your doctor. It’s perfectly okay to open the discussion, even if you aren’t yet experiencing symptoms. It’s always better to be proactive than reactive. 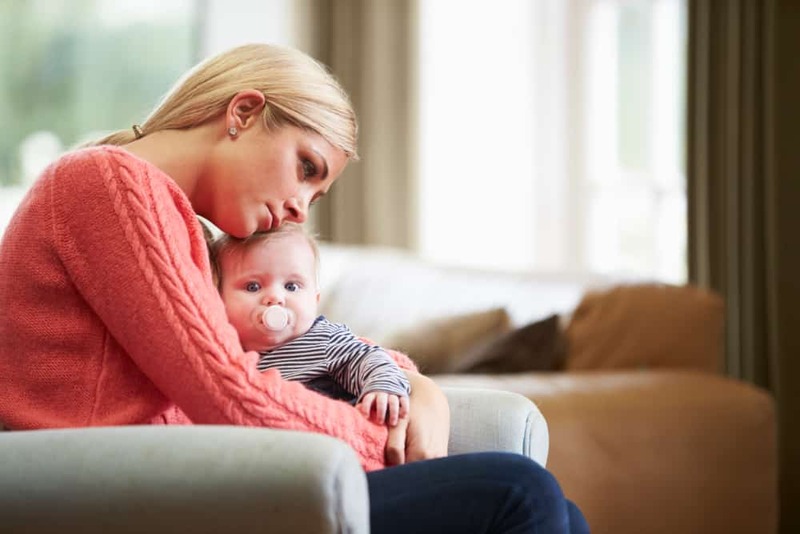 Since mothers with postpartum depression have a harder time caring for their baby, an early diagnosis could also mean your baby will feel less of an impact as well. Now that we’ve discussed what postpartum depression is and some of the risk factors associated with the condition, we will take a look at the symptoms (source). Extended periods of feeling sad or overwhelmed, crying often. Too little sleep, or too much sleep. Extreme fluctuations in your diet. Having no appetite or binge eating. A decreased interest in activities you would usually enjoy. Intense feelings of guilt or worthlessness. Overwhelming anxiety about the baby’s well being. Lacking the energy to complete simple tasks, like brushing your teeth. Restlessness or sluggishness, being unable to concentrate. Feeling ambivalent or having repeated negative feelings about your baby. Having thoughts about harming yourself or your baby. The exact symptoms will differ from woman to woman. Thoughts of harming yourself and your baby are generally only present in more severe cases. Plus, it is unlikely you will have all of the symptoms listed above. How Long Will Postpartum Depression Last? There isn’t a “one-size-fits-all” timeline when it comes to recovery. However, it is likely your postpartum depression will last from several months up to two years (source). If you’re prescribed an antidepressant, you will most likely be advised to continue the medication for at least six months. While two years may seem like a terribly long time to be feeling the way you do, with the proper care and support, you should see improvement month by month. However, be aware you may have flare-ups in your symptoms immediately before your period. Can I Prevent Postpartum Depression? Unfortunately, there is no proven method for avoiding postpartum depression. However, there are a few things you can do to lower your risk. Plus, simply being prepared for the possibility will go a long way in helping reduce the impact. While the baby blues don’t require as much strategy or any medication, postpartum depression does require treatment. Your doctor will design a treatment plan based on what symptoms you are having and how severe those symptoms are. There are several different routes your treatment can take, and a few of these methods may be employed at the same time. All of the treatments are similar to ones that would be used to treat clinical depression before or during pregnancy. Once you have received your diagnosis, and your health professional has developed a treatment plan with you, you’ll have to learn to cope with life as a new mother. With any prescribed medications, the period beforehand may be especially trying. Omega-3: Research shows that a diet heavy in omega-3 fatty acids helps relieve the symptoms of postpartum depression (source). So, eat more fish or add a supplement to your regimen to increase your omega-3 intake. Exercise: As we mentioned above, a regular exercise routine, even if it’s only walking for a few minutes per day, is recommended. Address Breastfeeding Difficulties: For some, breastfeeding lowers the risk of developing postpartum depression, but for others, the opposite is true. There is a condition called “dysphoric milk ejection reflex,” that can cause sudden depression in relation to your milk let down (source). Rest: We can’t say it enough, so do it as much as you possibly can. The old advice of “sleep when the baby sleeps” may seem a bit annoying but it is sound. While you may think that you need to wash dishes or fold some clothes, it is important you give yourself plenty of time to relax as well. Have Patience: Remember you can only do so much in the course of each day, and have patience with your abilities. Don’t be too hard on yourself about unfinished chores, or for feeling sad. Your treatment will eventually make things better, but until then, keep this in mind. Be Social: It is so easy to fall into the trap of isolation as a new mother. Most days you feel like you don’t even have time to shower, much less have coffee with the girls. But chatting with other adults can boost your mood and keep loneliness at bay. Self-Care: Create time for yourself that includes doing things you enjoy, like taking warm baths. There will be days where you feel like all you have done is breastfeed the baby or cleaned the house. You need to make sure you include days where you’re able to schedule in a little time just for yourself. Set Small Goals: Even if your goals seem meaningless compared to the “to-do” list you have racked up in your brain, having a concrete goal can help give you something to focus on and leave you feeling accomplished afterward. Talk About It: Talk about your emotions and your symptoms with your doctor, spouse, best friend, or in a support group. This can put things in perspective, but it can also clue people into how you are feeling instead of leaving them to guess. When it comes to postpartum, there is plenty of false information circulated, especially on the internet. Since all women experience their own post-birth difficulties, it can lead to many myths, but don’t let that trip you up. Take note of your risk factors, monitor your symptoms, and reach out for support from your spouse, family, close friends, and doctor. Postpartum depression is not something you have to do all by yourself. Have the courage to speak up and get help for it. If you are worried or feel scared and alone, there are plenty of resources where you can receive the support you need. Postpartum Support International is one of them. Call their toll free number to speak with someone immediately — (800) 944-4773. You can also text them at (503) 894-9453. On the website, there are also links to local resources and plenty of information on the condition. If you’re worried about your symptoms and need to reach out right away, call the helpline now. Rest assured, someone will be available to listen, and to talk you through everything. Remember, mom, you don’t need to go through it alone. There are people who understand what you are going through, and they can offer the help you need. Whatever you do, don’t suffer in silence. Get the help that you deserve. Your loved ones will be glad you reached out and you will be too. 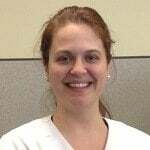 Anecdotally, my patients who breastfeed often report a period of intense mood change as their breast milk shifts from colostrum to transitional milk. The new mothers state they burst into tears or argue with their partners before their milk comes in. This is a part of the baby blues, as it should pass within the first few evenings after birth. As a mama with a NICU baby and severe preeclampsia, I can directly relate to the after effects. Mood disorders are real and can tarnish your first few months with your baby. If you experience this, seek help from an OB provider that you trust. You deserve to soak in the time with your new addition. If you have suffered postpartum depression in the past, please let us know in the comments section any tips you successfully used to help navigate this tricky time. Also, please share this with other new parents — this condition can happen to anyone, so we need to get the word out. Happy New Mum is the real experience, from real mums. We are here to help. A group of mums sharing their experiences on pregnancy, post-birth, breastfeeding, work-life balance, and more.